Dutch oven cooking is convenient when camping. RONAN — It’s camping season and with that comes the need for creative campfire cooking. 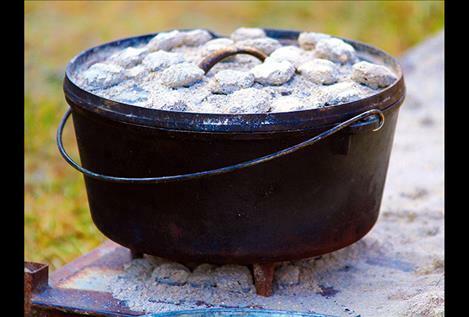 Dutch Oven cooking is a campfire favorite that is sure to bring your family and friends together. If it’s been a while since you’ve cooked in your Dutch Oven, or you’ve never tried it, you are in luck. The Ronan Chamber of Commerce Beautification Committee is hosting a Dutch Oven cooking class. A team of experienced instructors will be at the Visitor’s Center in Ronan June 18 from 10 a.m.- 2 p.m. to teach the class. Cost to attend is $10 per person. All experience levels are welcome, rain or shine. You can put these new skills to use September 17 at Ronan’s Harvest Fest, where the Beautification Committee will host a Dutch Oven Cook Off. Prizes will be awarded to the top Dutch Oven chefs in each category. To register, contact Ronna at The Flower Mill, 406-676-5323, or the Ronan Chamber Office, 406-676-8300. A coloring contest is also being hosted by the Beautification Committee in correlation with this new event. Local artist Tim Piedalue created an amazing piece for the contest that will be sent out in the June 8 edition of the Valley Journal. Additional copies can be picked up from Ronna at The Flower Mill or from Amy at Ronan Body Shop, Towing and Repair. Completed art should be dropped off at The Flower Mill or Ronan Body Shop. Spread the word and help us really kick off the first annual Mission Valley Dutch Oven Cook Off in Ronan.